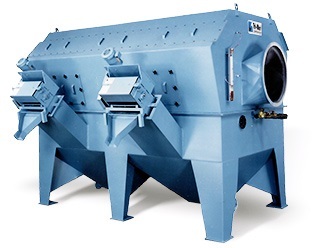 Whirl Wet dust collectors combine high efficiencies (99% efficiency range for a broad variety of applications) with the ability to install virtually anywhere in a plant environment without explosion suppression. Whirl Wets collect soluble and insoluble particulate using minimal water. Units are self-cleaning; particulate is deposited at the bottom of the unit as a dense filter cake, unlike baghouses which add to waste volumes. The patented design has no moving parts and does not use “maintenance” components such as nozzles or pumps. Energy generated inside the unit will not allow the system to clog under any operating conditions, so, the agglomeration and sticky residues that plug other dust collectors are not a problem with Whirl Wet. System capacities are 500 to 50,000 cfm. Construction is PVC, polypropylene, stainless steel, or alloy materials.